Although your swimming pool is equipped with a filtration system and that you use water treatment products, you will also need a robotic swimming pool cleaner or a pool vacuum for an in-depth cleaning. This equipment is essential for the routine maintenance of your swimming pool. Empty some of the water so that the level arrives just below the pipes holes. Use wintering floats for more safety. 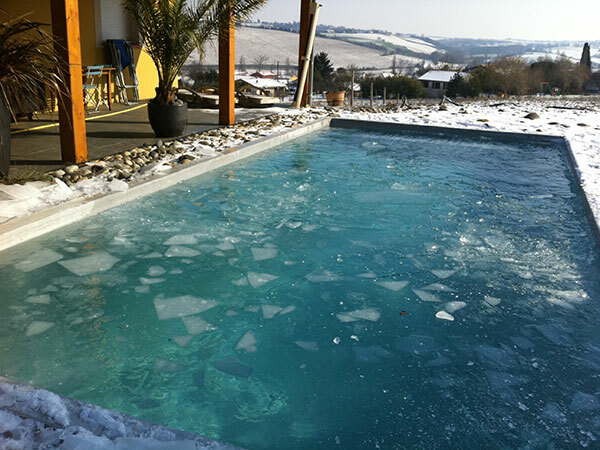 If very cold, the wintering floats will create a buffer effect to absorb the water thrust so that freezing will not damage the coating of your swimming pool. Stop the water filtration system. Pour a wintering product in the water to prevent limestone deposits. Cover your swimming pool with a wintering cover or a bars cover. Be careful: the wintering cover is not a safety device. It is just used as a freeze protection. The bars cover is a secure system which replaces the wintering cover. In spring, when you uncover your swimming pool, the water will have turned green. You will get back a clean water by adding chemicals. If you prefer to keep an eye on the water of your swimming pool during the winter, you will not use a cover. You will just have to run the pump and the filtration from 1 to 2 hours per day, during very cold periods, to brew the water and thus to prevent it from freezing. The pump can be equipped with a thermostat to start automatically from a selected temperature. In spring, as your water will not have stagnated, you will get back a clean water very quickly and without large addition of chemicals. You have a project for a traditional concrete swimming pool and you have some questions about maintenance and wintering? MARINAL, your pool specialist, will answer your questions. Do not hesitate to use our online contact form.